These term and conditions apply to all transactions on the Timeless Sofas web site. By placing an order with us you will be deemed to have read, understood and agreed to these Terms and Conditions. If you need any clarification on anything within these Terms and Conditions then please contact us at [email protected] or on 0161 870 9150 prior to placing an order. Nothing in these conditions affects your statutory rights as a consumer. Our FREE furniture delivery applys to UK Mainland addresses only. * When an order contains more than one furniture item, all furniture items will be delivered at the same time as soon as all items are available. An estimated delivery timescale is associated with each furniture product and we will make every effort to deliver your goods within this timescale. However delays can occasionally occur due to unforeseen factors out with our control. Timeless Sofas. shall be under no liability for any delay or failure to deliver the products within estimated timescales. *Excludes: Dorset, Devon, Somerset, Cornwall & The Scottish Highlands (an excess of ú65.00 be required for carriage). In order to ensure this situation does not occur we ask that you follow these few simple steps to ensure a hassle free delivery. Measure the height and width of any hallways and door accesses, as well as the entry clearance. Check the dimensions of the furniture in order to ensure the items will fit. Clear plenty of space to allow for the delivery and any packaging materials. You may cancel your order at any time by contacting us on [email protected]. If your goods have’t gone through the production process, we will refund the full price of the items and any delivery charge to the same card or paypal account you used to purchase the goods. If you decide to cancel items (before delivery has taken place) that are bespoke, made-to-measure or have been specially ordered for you, it may be unlikely that we will be able to sell these at the full selling price to another customer. In these instances, we have the right to deduct a 50% cancellation fee from your refund. We will endeavor to avoid any such charges but in some instances this may be unavoidable. Because every thing we make is made to order bespoke to suit each customers needs will only provide a 50% refund for the purchase price of the goods, but not any delivery charges. The cost of returning any items is the responsibility of the customer. Items must be returned in their original packaging. Please note that with the exception of faulty merchandise, for hygiene and safety reasons we cannot accept the return of certain items which have been opened (e.g. mattresses and pillows). Please note that a refund will only take place after the goods have been returned, inspected by our returns department and deemed to be in a suitable condition. For furniture items that require a two-man uplift you will be required to pay an uplift charge. This charge may be higher than the original delivery charge as the initial delivery cost is subsidised by Timeless Sofas Ltd.
A member of our team will contact you to discuss the quickest and most efficient way for you to return your products. You will be provided with an individual æreturns code so that on receipt of the items we can allocate any refund to you as quickly as possible. Please note that there will be no charge for any return if the delivered goods are faulty or if the items do not match your order correctly. In these instances replacement products will be delivered free of charge as soon as the items are available. 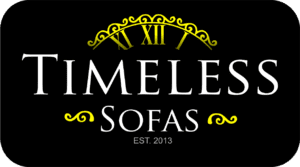 The products and services offered on Timeless Sofas websites are sold for use within the United Kingdom. Use of this web site shall be governed by Scots Law and will be subject to the jurisdiction of the Scottish courts.